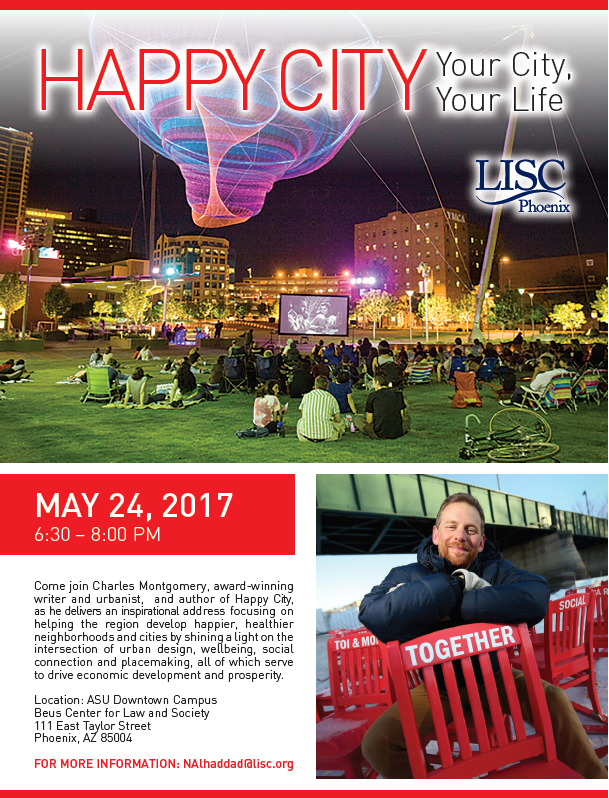 To honor the 25th anniversary of LISC serving Phoenix, we are celebrating by hosting a community talk by Charles Montgomery, award-winning author of Happy City. Montgomery advocates for building healthy communities through transformative conversations about cities, science and human well-being. The life-shaping power of urban design isn’t always obvious. But design has huge consequences for people, the economy and the planet. The good news: the happy city, the green city and the low-carbon city are the same place, and everyone can help build it. The Happy City team helps build happiness into neighborhoods and cities through research, public events and collaborative consulting. Their work is grounded in evidence from psychology, neuroscience, public health, and behavioral economics. Their inspiration comes from urban innovations around the world. And check out the Facebook event here, be sure to SHARE!